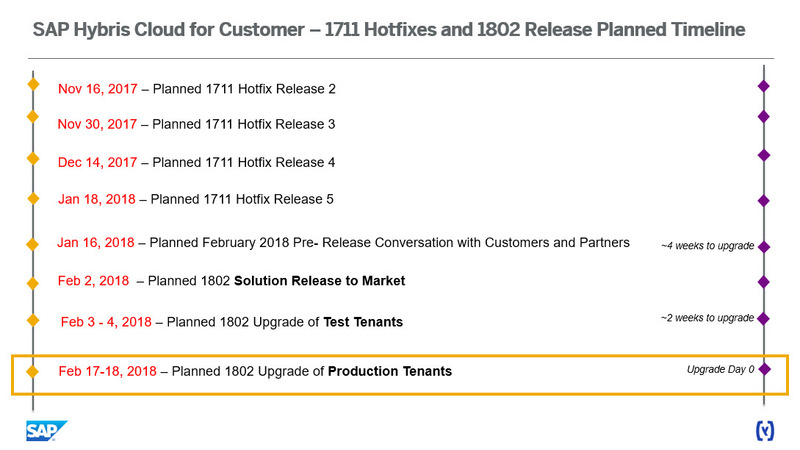 SAP Hybris Cloud for Customer is close to release its February 2018 (1802) version. Please find below a visual timeline for the release and upgrade. We have also added the 1711 Hotfix schedule along with the other important dates. Please note: The Hotfix dates only represent HFC release dates. HFC will be deployed in the customer system in immediate next Contractual Maintenance Period (CMP). We will host a pre-release webinar on Tuesday, January 16, 2018. Please find below the date-time and conference details for these webinars. We will record all the sessions and share the presentations and recordings after the webinar on SAP Hybris Cloud for Customer Community and Hybris Wiki.